This month, I’d like to focus in on one finding in particular: the relative lack of awareness of Make magazine and the ensuing implications in rural and underserved communities. Partway through the summer, we changed our summative activity that the end of the three-day workshop. 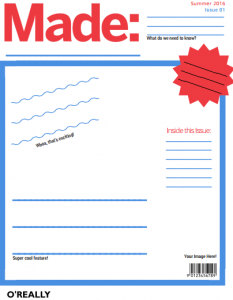 Our colleague Amber created a blank parody cover of Make magazine called Made, and we invited participants to imagine that Made was going to create a special issue focused solely on their makerspace. They were asked to provide the cover headlines that would relate to the vision they had worked on during the workshop. And that’s where things got interesting. Overwhelmingly, only one or two attendees had ever heard of Make magazine. So what are the implications of this? What does making look like when the flagship publication isn’t a reference point? Do you notice anything similar in your space?